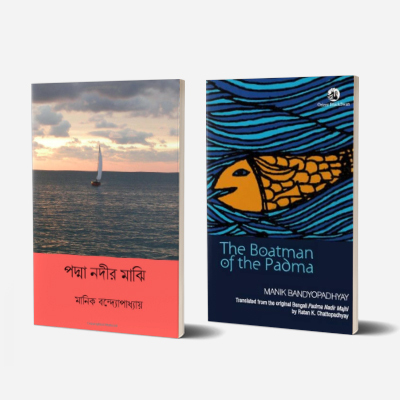 Bandopadhyay’s 1936 novel, Padma Nadir Majhi, narrates the story of a poor fishermen community residing on the banks of the River Padma in a fictitious village called Ketupur in present day Bangladesh. Perennially dependent on the river for fish, the lives of the fishermen community form the focal point of this river centric novel. The novel revolves around Kuber, a poor fisherman. Sole breadwinner of his family, he resides, with other members of the fishermen community on the fringes of Ketupur where he lives with his wife, daughter and two sons. In his daily quest for survival he befriends a local businessman Hossain Miya, a small businessman suspected of human trafficking and other clandestine activities. At the heart of Hossain Miya’s ‘rags-to-riches’ story stands Moynadip, a remote silt bed island or char. It is to this char that Hossain Miya takes settlers from different parts of the region to build up a settlement. The settlers, hapless victims of either natural calamities like floods and cyclones or social ostracism, accompany him in search of new beginning. Ironically, in the end Kuber embarks on the journey to Hossain Miya’s river island to avert a false charge of theft. The Padma is at the centre of the lives of the marginalized communities of fishermen, boatmen and small peasants. The river silently witnesses their daily chores, small joys and sorrows. Written prior to World War II, the novel criticizes the society that supports the elites, while inhumanly exploiting the underprivileged and impoverished class of fishermen. Even for small matters the fishermen community depends on the local landowner’s mercy and charity. The importance of the novel lies in the fact that it ushers in a new hope for the inhabitants who are ultimately able to break away from the cruel nexus of corruption and exploitation at the hands of the social elites and begin a new life. Kuber’s journey to Moynadip clearly indicates the dawning of the new era where people like him have the choice whether or not to accept their destinies unquestioned. His transition marks the ultimate cross over to a new world order that abounds in equality and justice. Moynadip is thus a metaphor for liberation where people work together without being exploited by privileged classes. The novel was transferred to celluloid in 1993 and remains relevant for its discussion of class politics but remains timeless for its engaging and emotional narrative. Prabodh Kumar Bandyopadhyay (1908-1956), best known by his pen name ‘Manik’, is often called the founding father of modern Bangla fiction. He wrote over forty two novels and two hundred short-stories in his short life, which was plagued with ailment and poverty. Putul Nacher Etikatha and Chatushkone are two of his distinguished works.